Wall Street Journal recommends it to all professionals. Grab it, manage your contacts. 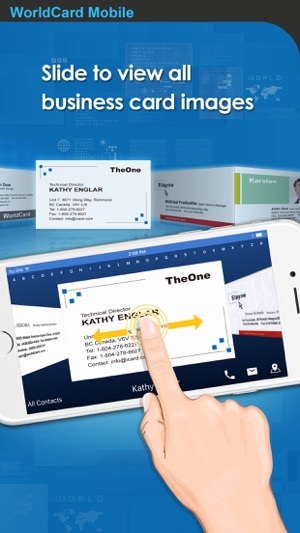 WorldCard Mobile, the leading business card scanning application for iPhone, uses OCR (Optical Character Recognition) technology to instantly transfer information from business cards to users' native contacts. With a simple click of the camera, you no longer have to manually input contact info from business cards or email signatures. 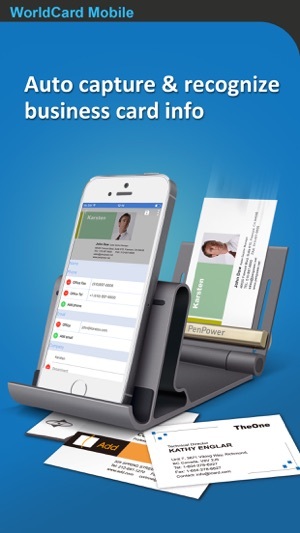 - Capture business cards anytime & anywhere. - Capture business card images with the iPhone’s camera. - Recognition of 25 languages: English, French, German, Italian, Spanish, Portuguese, Dutch, Czech, Greek, Hungarian, Polish, Portuguese (Brazil), Russian, Slovak, Spanish (Mexico), Turkish, Finland, Sweden, Denmark, Norway and Arabic, Traditional Chinese, Simplified Chinese,Japanese, Korean. - Sort recognized information by name, position, company, phone number, fax number, address or other fields. - View and manage contact info with Card holder function. Make a phone call, send SMS and email to your contacts directly. - Select partially and recognize the specific area that contains the correct data. - Find your contacts on Facebook, LinkedIn and Twitter. Expand your social and professional networks. 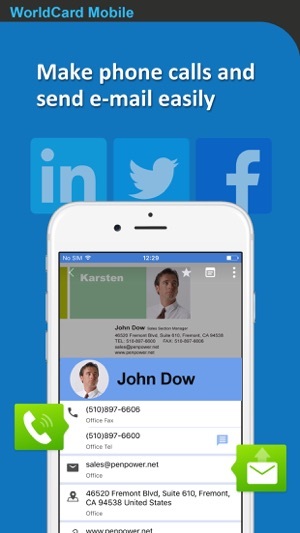 - Sync with Google Contacts and manage your contacts seamlessly. - Exchange contact data through Open In, Mail and iTunes File Sharing. Import/export or backup your data on Mac/Windows quickly and conveniently. 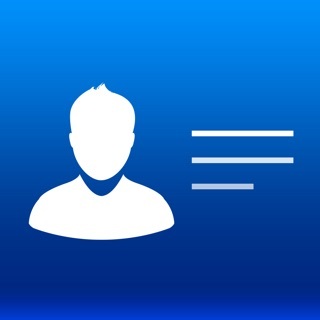 - Share or backup your contacts via cloud services (iCloud / Dropbox). Manage your contacts on all devices, such as Mac or Windows PC. - Recognize QR code to get more information easily. - Copy email signatures and add them to your contact lists. 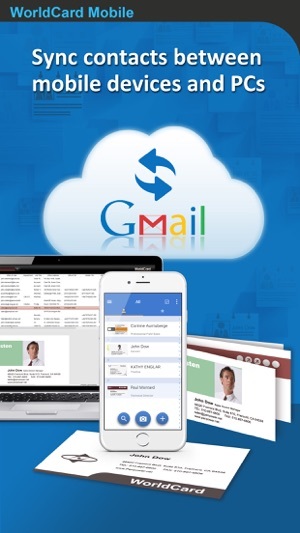 - Fix sync issue with Google contacts. I had used World Card for several years. It isn't perfect, but it has been a quick way to get business cards into my iPhone contacts, which in turn synchronize with Outlook. I was reasonably pleased with the way it worked. In the latest update, I was asked for permission to sync my Gmail contacts which I did not wish to do. It gave me no choice in the matter. As a result, I deleted the app from my phone because I have no interest in allowing it undefined access to other applications. Because the app gave me no choice, and I had no idea what it would do with data from my Gmail contacts, I considered the security risk unacceptable. When this was fixed and I noted that it now worked with iOS 11, I decided to give it another try. I just spent 30 min trying to scan 2 cards. The first wouldn’t auto crop. Finally it did. 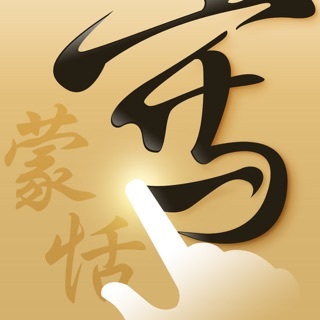 The second I never could get it to recognize, probably because the text is written in the opposite direction as usual. After being fooled twice, I am going to buy another app. I had a similar thing happened to what the other reviewer said. I thought that world card once I paid for the professional version would sync to my Outlook. I haven’t used it in a while I’ve recently spent literally an hour trying to add a couple business cards and see if they’re synchronizing to Outlook. This is crap. I’d like my money back but I’m sure that’s not gonna happen and it’s going to take way too long to try to even deal with it. I have tried multiple settings and cannot get it to sync it does show up on my iPhone in the contacts but I need it to go to my laptop. I don’t even see where it came in the Gmail. 9/25-Can you please fix the save to outlook when you take a picture of a business card? This was the reason I bought your app in the first place and I am very disappointed that it does not work with iOS 11. Most people do not use Gmail sync for business contacts, so forcing us to do it is not helpful.